All of us are aware from the days of our childhood that the highest mountain peak in the world is Mount Everest and it was discovered by George Everest. It was only much later that one came to know that Sir George Everest was the Surveyor General of Bharat and the peak was so named as he had discovered it to be the highest in the world. As the Surveyor General, he had his offices in Dehradun and used to stay in Mussoorie. He left Bharat in 1843, almost 200 years ago, but his house in Mussoorie is still being preserved and is now a place of tourist interest. The truth, however, is somewhat different. It is a fact that Sir George Everest was the Surveyor General of Bharat from 1830 to 1843, but it is also a fact that during his tenure of office, Mount Everest, that we know of today, was only known as ‘Peak XV’. Everest had neither initiated the process of measuring the height of this peak, nor was he instrumental in its naming, which was done much later, long after he had proceeded to England to enjoy his retirement after 1843. Located on the border of Nepal and Tibet, this ‘Peak XV’ has been worshipped as a holy place by the Tibetans, who called it Chomolungma, the Mother Goddess of the World. 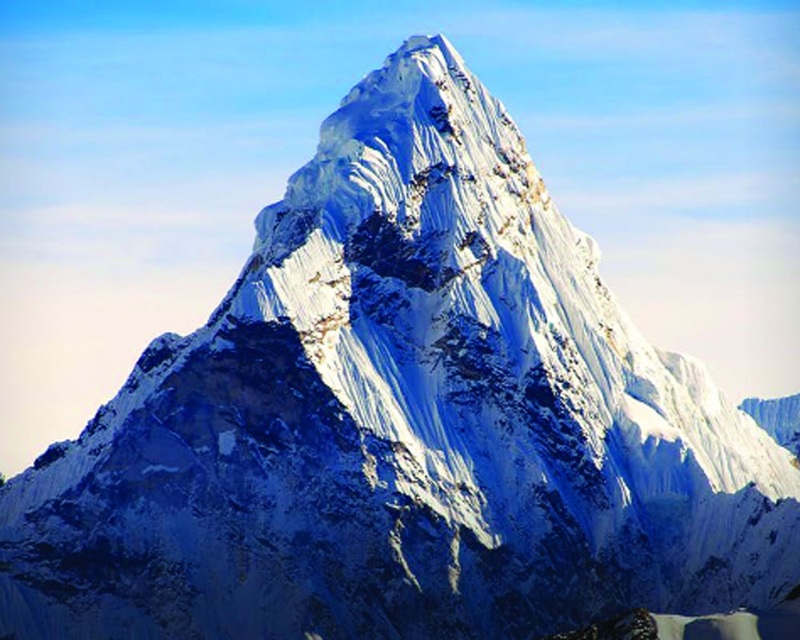 In Nepal, this peak is known as Sagarmatha, meaning the peak of heavens. Even these days, this peak is addressed by its traditional names, both in Tibet and Nepal, while we have followed what was given to us by the British ie Mount Everest. In fact, the name Everest was given by Col Sir Andrew Waugh of Bengal Engineers, who succeeded Everest as the Surveyor General of Bharat from 1844 to 1861. Circumstances under which ‘Peak XV’ was named as Mount Everest are rather peculiar and reveal a very biased handling of the matter so that the entire credit goes to the British officers of the East India Company. Going through the historical records of the Survey of India Volume IV: 1830 to 1843, pertaining to the tenure of Sir George Everest, one can observe at a glance that he had shown no interest in ‘Peak XV’ during this period. It was his successor, Andrew Waugh, who made the official announcement of ‘Peak XV’ being the highest known peak of the world in 1856, the measurements had, of course, been initiated much earlier and finalised by our own Radha Nath Sikdar in 1849. Recognising the work of Sikdar, the Government of Bharat had issued a postage stamp in his honour in 2004. But his work is of such a great importance that issuing a postage stamp and then forgetting about him does not do full justice to his unique and great contribution. It was Sir George Everest who had recruited Sikdar in the great trigonometrical survey and became extremely fond of him. “Radanauth is high in favour with everybody, and universally beloved in the GT Survey. You will not know him for the same person when you see him again, for he is no longer a puny stripling, but a hardy energetic young man, ready to undergo any fatigue, and acquire a practical knowledge of all parts of his profession. Later, on account of a special technique developed by Sikdar for accurate computation of heights and distances through Spherical Trigonometry, he virtually became indispensable to the organisation and rose to become the Chief Computer in the office of SGI. In that position, he moved from Dehradun to Kolkata in 1849. As to why Andrew Waugh gave the name Everest, even though he had left the scene long ago, is an interesting piece of history. Had SG Burrard, a later Surveyor General of India, not acknowledged the good work of Radhanath Sikdar through a research paper published in 1904 in the scientific journal Nature, these facts would not have come to light. He published in detail various steps taken for the measurement of ‘Peak XV’. This in a way also exposed the machinations of Andrew Waugh who had tried his level best to take credit away from, to where it truly belonged, that is Radhanath Sikdar. It is human nature that in case something important is achieved, one tries to take credit or gives credit to someone, but in this case, Waugh specifically mentioned that Sikdar had nothing to do with this work, indicating his bias. Later, he could be seen placating him by asking him that he should be happy that the peak had been named after his mentor. Andrew Waugh also gave the additional charge of the Indian Metrological Department to Sikdar, raising his salary to Rs 600 per month. This was unheard for a Bharatiya in those days. Clearly, all these efforts were to keep him happy but away from the core of the survey work. SG Burrard’s publication in the Nature specifically mentioned that the Chief Computer (who was Radhanath Sikdar) from Calcutta had informed Andrew Waugh in 1852 that the peak designated ‘XV’ had been found to be higher than any other highest measured peak in the world at that time. Raw data from theodolites, taken from seven observation stations at Jirol, Mirzapur, Janjpati, Ladiva, Haripur, Minai and Doom Dongi was collected at the trigonometrical survey at Calcutta. This was then processed by Radhanath Sikdar and conveyed to Andrew Waugh that ‘Peak XV’ had been measured at 29,002 feet, taking the mean value of all observations. Considering that the scientific instrumentation available at that time was only of a rudimentary nature, the level of accuracy reached was almost 100 per cent, and this figure has not undergone any change, despite the current state of technological progress. Correspondence between Waugh and Sikdar reveals that Waugh did privately acknowledge the achievement of Sikdar but did not recognise his work on record and in public. In his letter dated August 25, 1856, Waugh wrote to Sikdar that he was glad to hear that naming the peak as Everest had given the latter a lot of satisfaction. Thus, it is clear that the name Everest was given to ensure that Sikdar, who could have been the rightful claimant for credit, did not object as he was extremely fond of Everest, who had recruited him in service. The situation would have remained obscure but for the research paper of SG Burrard in 1904. Later, Professor Meghnad Saha acknowledged this feat in 1938 by giving Sikdar full credit. Earlier, Kenneth Mason in 1928, recognised his work as also John Keay in his book, The Great Arc. In the given situation, changing the name of Mount Everest to Mount Sikdar Everest will perhaps do full justice to Radhanath Sikdar and give him worldwide recognition, which was legitimately his due, long time ago. We do not have to seek anybody’s approval for such a change as the rationale is all well-documented. Even if the world continues to call it Everest, in Bharat, we could still call it Sikdar Everest. On several earlier occasions, achievements of Bharatiya scientists have not been recognised, as Sir JC Bose could have got the Nobel Prize for Physics or at least shared it with Marconi for his work on wireless and radio; SN Bose could have got the Nobel Prize way back in 1932 for his work with Einstein on Bose Einstein condensate but atleast he was recognised, though belatedly naming the God particle, Higgs-Boson after him. Naming Everest as Sikdar Everest would be a recoginition of a scientist whose work has stood the test of time. Besides it would also justifiably add to our national pride. Many urbanites in Bharat, especially the Lutyens’ elites, scoff at the idea of renaming towns, cities and other aspects of our cultural heritage that were either changed or distorted by colonizers. They mock such moves as hollow posturing to recreate a golden past without first addressing the real challenge of poverty. This position finds many takers in the citizenry who indeed are pre-occupied with the daily struggle of survival. But contrary to the old adage ‘what’s in a name?’, names, and language in general, matter a lot. They are carriers of cultural memory, and affect us on many levels. We have seen how so many Sanskrit/Indic terms like Dharma are actually non-translatable, and lose their meaning when incorrectly relayed in the English language by modern Indologists. Cultural Digestion of a less dominant culture by a more dominant culture is motivated by the desire to assimilate and reduce differences by asserting sameness. As a consequence, the less dominant culture is stripped of its distinctive, traditional cultural practices and values. These are now a component of the dominant culture and become associated with it. Memories of origins are erased and, eventually, the less dominant culture disappears. Examples of Digestion are provided below. The project of reclaiming our cultural and civilizational identity can, and should, go on in parallel with the project of regaining our economic prowess and improving living standards. These are not mutually exclusive goals, and are actually interlinked – without pride in our civilization and past, we will find it hard to motivate ourselves to excel in the present. So changing the name of Mt. Everest to Mt. Sikdar Everest as the above author suggests makes sense. But it makes even more sense to adopt the name actually used by the people who live in the region where the highest peak of the world is situated – hence calling it Mt. Sagarmatha-Chomolungma would be apt. This desire to patent and name everything after the individuals who ‘discovered’ them in the modern era, is flawed and must be rejected.